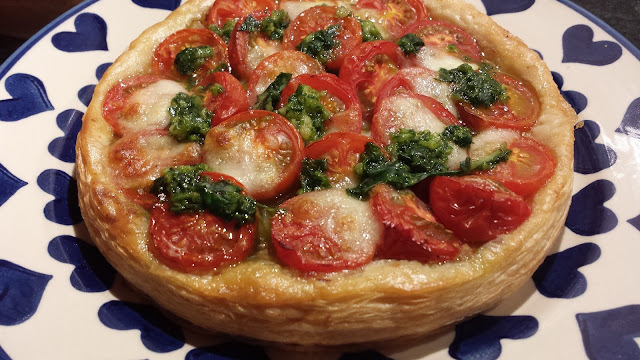 With the good weather about to make a come back (just in time for the kids returning to school), this is the perfect tart to celebrate gorgeous Irish cherry tomatoes. I say Irish cherry tomatoes because I am a big believer in buying Irish when it comes to tomatoes, the reason being is most supermarket tomatoes are Dutch. For me in the main are horrible they have no taste and are over produced. This tart however showcases our home grown red jewels. 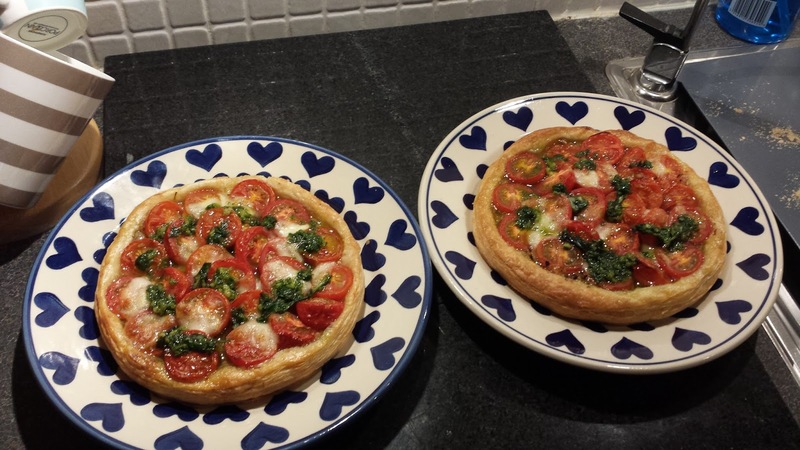 These tarts consist of a puff pasty base, onion filling topped with tomatoes, mozzarella and pistou. I say pistou here and not pesto as this is the French version, it contains no cheese or pine nuts. I hope you make this below as its so simple and easy to make. 1) Divide your puff pastry in to two rounds. Roll out on a floured surface to roughly to 20cm rounds about 2-3 mm thick. Remember puff pastry will rise so thin pastry before cooking does not matter. 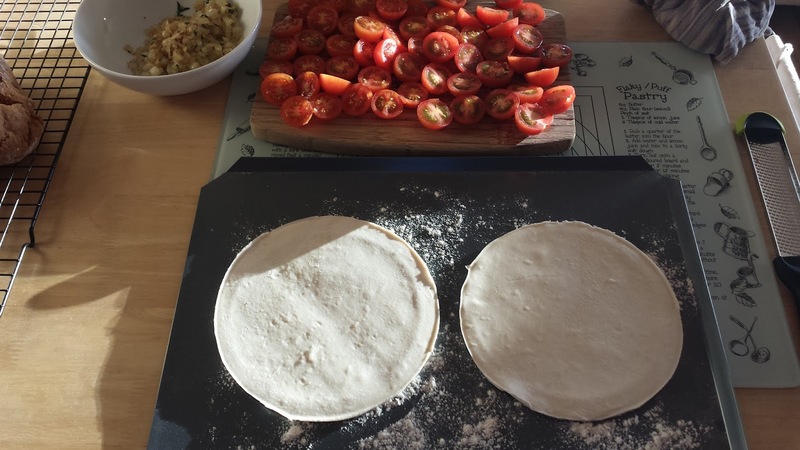 2) Take a side plate about 15cm in diameter and cut out two rounds from your divided pastry. Transfer to the fridge whilst you prepare your onions and tomatoes. 3) Pre heat a pan to medium heat and add a glug of extra virgin olive oil, onions. Start to sweat the onions off, adding salt, pepper and the thyme leaves. What sweating means here is you want to keep the heat low enough so as not to brown the onions but keep them translucent, cooking for 8 minutes. Once cooked remove and set aside. 4) Remove your pastry discs from the fridge and assemble the tarts. Pre-heat oven to 230c/210c fan oven / gas mark 8. 5) Spread your sweated onions split out over the two pastry discs. Arrange the tomatoes on top like below leaving .5mm-1cm gap at the sides. Brush olive oil around the sides and on top, seasoning with salt and pepper. 6) Bake your tarts for 14 mins. 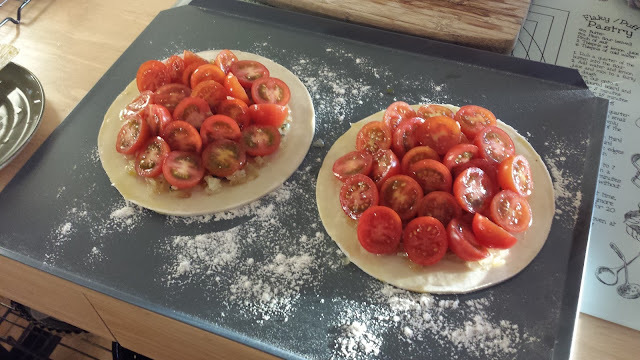 7) Whilst the tarts are baking you can now make your pistou. With a pestle and mortar crush your basil and garlic together to a paste. Add 100ml of olive oil, seasoning with pepper and salt, mixing it all together. 8) Remove your tarts from the oven and sprinkle with some torn up bits of mozzarella. 9) Place back in the oven for 4 mins. 10) Remove from the oven and allow to cool for 5 mins. Once cooled transfer to two plates and drizzle over the pistou.